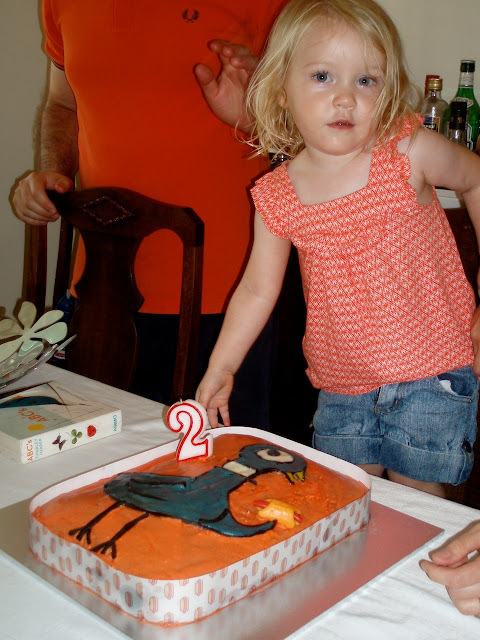 Little Hiccups: Party time... again! I can't believe it, but Ava's 4th birthday is coming up very soon - where has the time gone? I'm currently in the process of creating invitations for her upcoming birthday party which has prompted me to have a look through invitations I have designed in the past. Some I have been really happy with and others which seemed good at the time just don't seem to cut it now. The invitations that I have been most happy with were for Ava's 2nd birthday. Wow, two years ago already! While I was pregnant with Ava I came across a fantastic book called "The Pigeon Finds a Hotdog" by Mo Willems. It very quickly became my favourite children's book. The drawings have a retro style, muted colours and are quite simplistic; but with just the slightest line here and there Mo Willems creates the mood of the characters. And boy does that pigeon have some moods! From the look of sheer excitement on the pigeon's face upon finding a hotdog through to the frustrated tantrum thrown at the duckling who wants to share the find, the pigeon goes through almost every emotion you can think of. 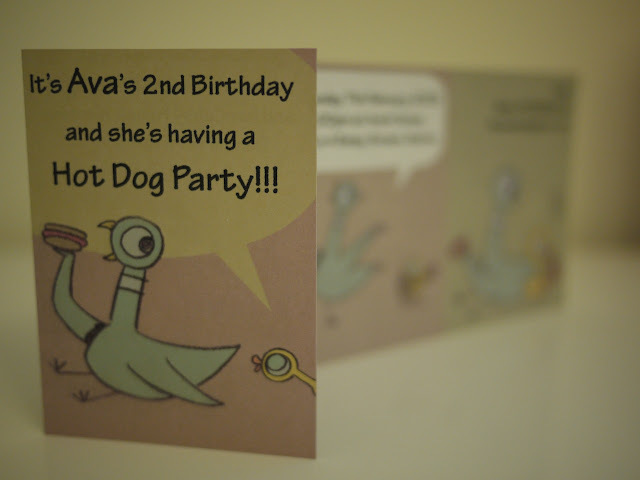 For Ava's 2nd birthday party we decided to throw a "Hotdog Party" fit for a pigeon. Ok, that doesn't sound so great considering the low standards pigeons usually have. Mmm... cigarette butts... yum! Let's rephrase that as "a Hotdog Party fit for THE pigeon"! Much better. The pigeon featured on the invitations, lolly bags and birthday cake. Hotdogs were served and I even managed to track down Gummi hotdogs to go in the lolly bags. The invitations were laid out in the same format as the pigeon books. All of the text in the pigeon books appears in either speech or thought bubbles. This worked very well for the invitations - just delete the original text and add in party details! Copies of the invitations (front and back) are below as well as a photo of the folded finished product. 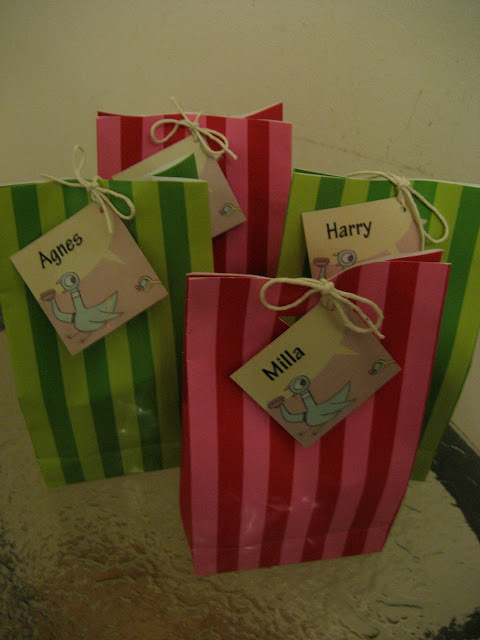 The lolly bags featured the pigeon on the name tags. 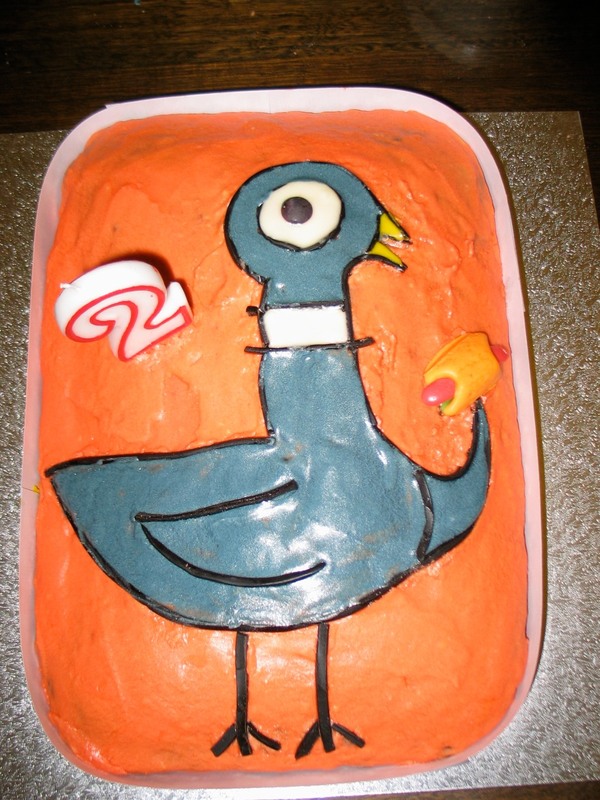 The pigeon also featured on the birthday cake - complete with Gummi hotdog! I wrapped the outside of the cake with paper printed with the hotdog design from the back of the invitations. This design was taken from inside the dust jacket of the book.